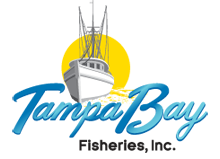 Tampa Bay Fisheries was established in 1991 by a group of experienced seafood professionals. After only three years of operation, Tampa Bay outgrew it's startup production facility and began to search for an expansion location. A new site was found and purchased. The acquisition of a larger plant allowed us to continue to grow at a rapid pace. We source raw materials both domestically and internationally. Our raw material buying decisions are based on Quality, Cost, Seasonality and Availability. Tampa Bay Fisheries has the ability to handle a diverse base of value added products including Breaded Shrimp, Scallops, Oysters, Fish, Crab Stuffed Products, Crab Cakes, Cooked Shrimp, P&D and many other excellent items. Our belief is that diversity is another word for strength. Extensive production capability, wide ranging raw material sourcing, broad customer base, proactive/responsive sales, customer service and logistics personnel. These elements all contribute to our strength and stability, which in turn, allows us to be focused on your needs. Our goal is to simplify a very complex business so we can better serve you, offer products that are superior to our competitors, allow for one stop purchases and deliver to you the lowest, most cost effective pricing available.